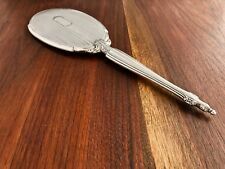 ANTIQUE AUSTRO-HUNGARIAN ART NOVEAU SILVER HAND MIRROR. 1868-72 HALLMARKS. A STUNNING LITTLE SILVER HAND MIRROR WITH VERY TYPICAL NATURAL STYLE ART NOUVEAU ERA LOOK. HALL MARKS FOR KLAGENFURT. 925/950 SILVER PURITY. IMPORT AV MARK FOR 1860'S PERIOD. IN VERY GOOD SOLID CONDITION. The hallmarks, though rubbed, show that this was made in 1922 by Birmingham silversmiths Adie Brothers Ltd. This beautiful English mirror is made of silver and faux tortoiseshell. At 28cm in height, it is of a very good size and feels good in one's hand. A stylish addition to your dressing table. denn ennn A20 1089 1179. Weight: 13.49 troy oz (419.7g)(inclusive of the mirror). Weight: 7.80 troy oz (242.5g)(inclusive of the mirror). - Width: 5in (12.7cm). What fabulous work! Perfect for your dresser! L: 13 1/2 x 6 1/2in (34.5 x 16.5cm). Antique Japanese ! Wooden Bound Hand Mirror. Very Good. Wooden Bound Hand Mirror. Minor Marks On Wood: Very Good Condition. What an wonderful gift for a loved one! - Length: 6 1/2in (16.5cm). - Width: 4 3/4in (12cm). ANTIQUE STERLING SILVER VANITY SET. MADE BY LA PIERRE MANUFACTURING COMPANY MIRROR, BRUSH & COMB NICE CONDITION!. Hallmarked solid silver by maker B & Co. Elegantly shaped mirror & brushes set in a velvet & silk lined presentation carry box. With hand mirror & 3 brushes. Showing the anchor for Birmingham letter P for 1989. MADE BY EASTWOOD & PARK CO., NEWARK, NEW JERSEY, USA. HISTORICAL FOOTNOTE:Even though this mirror is not hallmarked anywhere that I can find by a maker, I was able to research this patent date. It refers to US Design Patent number 35,993, dated August 12, 1902, assigned to Eastwood & Park Co. (1888-1922), historic listed USA silversmith from Newark, New Jersey, and designed by Walter Turton of Arlington, New Jersey. 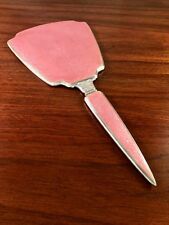 Such a gorgeous 1920's Hand Mirror. Full Size and very heavy weighing 14 oz. Features green enamel guilloche with hand painted center. The mirror is beveled. CONDITION: very good THINGS TO POINT OUT: 1. There is some green enamel loss at the very top edge of the enamel the rest is perfect 2. The is a 2 dings on the top end and a tiny ding on the side of the silver frame.. not really noticeable..just found it while going over the mirror again. 3. The mirror has some light colored spots ...normal for this age...on the minor side in my opinion. The mirror also has some silver loss right at the bottom in the beveled area..see last picture. As with all of my items, this item is FINAL SALE, AS IS, and is NON-RETURNABLE, NON-EXCHANGEABLE, and NON-REFUNDABLE. Antique Chased Solid Silver & Faux Tortoiseshell Art Deco Bevelled Hand Mirror with the initial “ M “ engraved on the silver. This is in excellent condition. 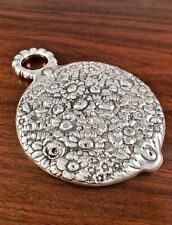 It has an extensive covering of silver which is all handworked / Engraved. Carved from a single piece of wood, there is a tight 6 1/2" long age crack along the back as shown, the top of it visible just to the right of the flower blossom crown. Spotting to the old mirror as shown - no cracks, breaks or repairs - there is one small surface chip on the bevel at the bottom. (Or maybe it is to simulate a faux finish simulating marble or turquoise, since that was commonly done on palace walls as well, and in any case, the veining in the "stone" is realistic and expertly done. ). Rather than a traditional round or rectangular shape, this mirror uses curves to create waves and peaks. A 3D effect is created when the mirror is tilted from side to side and shadows are produced, giving the illusion of depth. Mid-century Georg Jensen(Denmark) sterling silver hand mirror styled in a tulip like motif. The mirror is in nice condition with no dings or bends. Age appropriate light surface wear from use. The glass is good with no cracks, cloudiness or reflective loss. This gorgeous item remains in excellent antique condition and bears no monograms. A lovely object that will look delightful wherever you hang it! -Length: 4 5/8in (11.7cm). - Width: 3 3/4in (9.5cm). A beautiful hand vanity mirror by Yves saint Laurent . 1980`s AT ITS BEST ! Velvet pouch 34x19cm. Sterling Silver and Enamel Hand Mirror - Antique George V.
This beautiful and tactile scent bottle has a Rococo look and feel to it, the piece is crafted from sterling silver and has Birmingham hallmarks, the heart shaped bottle would traditionally have been given as a love token making this a great gift idea for a loved one. A very luxurious antique hand mirror High quality - Heavily Jeweled This is a large full size hand mirror Measures 13.5 inches long and 6.25 inches wide at the top. It is heavy weighing approx. 1.25 pounds. Looks to be Austrian - No markers mark is found FEATURES: Jeweled heavily on the front and the back The frame is outstanding in design .. Triangle shaped top. Superb filigree work....The whole mirror is all filigree exept the sides. Excellent beveled glass *NOTE: in the pictures there is a line on the mirror...this is just a reflection. no lines. Jeweled with colorful glass jewels - all bezel set CONDITION: EXCELLENT No missing stones Nice heavy filigree frame , not bendable It is very sturdy, meaning if you shake the mirror there is no sound, no rattling of the mirror all secure. ANTICA SPECCHIO DA TOELETTA IN ARGENTO 800. SPECCHIO COEVO CON BORDO ESTERNO MOLATO. STRUTTURA INTERNA IN LEGNO IN PERFETTE CONDIZIONI. SPECCHIO IN PERFETTE CONDIZIONI. I DON'T LIKE TO RECEIVE AND EITHER TO GIVE BAD SURPRISES. Fucsia Pink. Compact Mirror. On/Off switch to extend battery life. LED Lights. 6 powerful LED lights. One regular mirror, one with 2x magnification. Easy to replace battery. Compact Mirror. On/Off switch to extend battery life. LED Lights. 6 powerful LED lights. One regular mirror, one with 2x magnification. Easy to replace battery. 2 high-end polished glass mirrors.